The group, which split off from College Republicans last year, was first profiled for its fringe views by The State Press in October of last year. The Phoenix New Times piece that sparked the investigation was based on a dossier, compiled by former College Republicans United members, that leaked chat logs, images and other inflammatory material implicating members and leadership of College Republicans United. The dossier also included excerpts of The State Press' prior reporting. 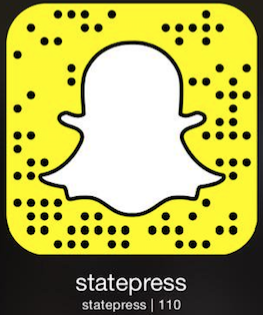 In addition to the dossier, The State Press has reviewed more than a dozen chat logs leaked to The State Press over the last five months, and talked to several former members about racist and anti-Semitic trends in the organization. Screenshot of a Facebook message written by former College Republicans United president Rick Thomas. "Realizing it would give me attention I did not want to have, I decided to speak out against the white nationalist and Neo-Nazi views of certain members of CRU because they are disgusting and unacceptable," Darian Douraghy, a former CRU executive board member with firsthand knowledge of the document, said in a statement to The State Press. "I was thrown out of the club for doing so, and do not regret it all." The University said in a tweet that the New Times' story was the first time it was made aware of the dossier, which is 19 pages long and includes screenshots, photos, and additional context for the comments and imagery featured. When asked, an ASU spokesperson repeated the statement made on Twitter in an email. The University official also said it was unable to speak on ongoing Student Code Of Conduct violations when asked about the University's response to The State Press' October story. The dossier first circulated in late October 2018 among campus groups and on social media. In a response posted on its website, CRU said the dossier served as "blackmail attempts on our student organization by people removed from CRU," and that the New Times' piece was "nothing but a hit piece and not worthy to reply to directly." The CRU statement acknowledged that one of the members exposed in the dossier, Republicans United chairman and ASU alum Kevin Decuyper, was involved in racist and inflammatory conversations in a Facebook group titled, "Trad Muarsnebel," or the reverse spelling of Lebensraum, a term used by Nazis to refer to the space needed by a state or nation to naturally grow. Decuyper's comment in the Facebook group referred to normalizing the alt-right worldview by trying to conform to less extreme views, including posing with an African-American person. CRU said in its statement that following the incident, Decuyper was given a warning, but ultimately allowed to stay. The authors of the dossier, however, said they were eventually kicked out of the club for continuing to object to Decuyper's presence. Other pictures in the dossier include former CRU President and founding member Richard Thomas posing with a tiki torch in front of a Dodge Challenger, reminiscent of events in Charlottesville, Virginia, in 2017. During the "Unite the Right" white supremacist rally in August 2017, counter-protester Heather Heyer was murdered and others were injured by white supremacists who drove into a crowd with the same type of car. The statement from CRU contends that the picture was a set-up and that Thomas is anti-racist, as is the rest of CRU. "The picture (sic) were acquired by the former members who had plans to use this as blackmail in retaliation for not being endorsed by Richard for leadership of CRU," the statement read. "At no time has Richard or CRU ever supported racism or what happened at Charlottesville. To this day, CRU has protested the murder of Heather Heyer." The group drew controversy earlier this week when Tim Gionet, better known by his online handle "Baked Alaska," attended its weekly meeting. Gionet, a prominent online agitator in alt-right political communities, marched at the 2017 "Unite the Right" rally. That viral meeting was also addressed in the statement, with CRU leaders saying they believe in forgiveness, and that Gionet has renounced his formerly racist ways. "We were pleased to hear Baked Alaska renounce ethno-nationalism and white supremacy," the group said in the statement. "He said at some point he would love to hold a forum at ASU about why he left the alt-right and wanted an opportunity to urge other extremists to change their minds." "We believe in Christian values of forgiveness and believe that people can change and redeem themselves over time, opinions are not set in stone," the statement said. This is disgusting and I'm ashamed of the ASU College Republicans United group. In addition to calling the dossier blackmail, the CRU statement also includes additional photos of racist and anti-Semitic remarks by the authors of the dossier. Members of CRU were not able to be reached at the time of publication.